This is part 3 in our series of “questions that might make some digital marketing agencies squirm” and it is something many clients are likely familiar with. 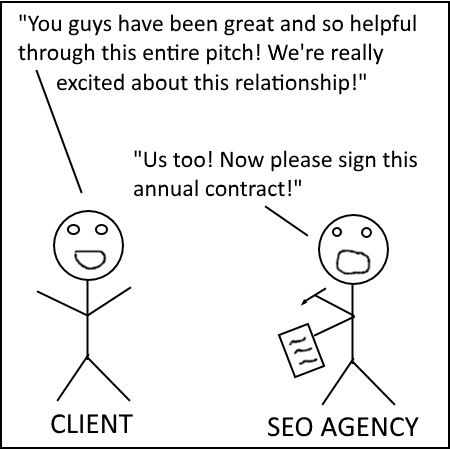 Starting an SEO campaign between a consultant/agency and the client has a lot of similarities to the beginning stages of many relationships. Unfortunately, for some, the relationship it mirrors can be one that quickly fizzles out after a year. The agency begins to take the client for granted and isn’t fully transparent on what they’re actually doing behind the scenes. We’ll breakdown some of the trouble signs you should keep an eye out for. Get your entire website indexed. We’ve dealt with multiple clients that didn’t even realize that pages or even entire sections of their site were being blocked from being crawled by the search engines. The agency can typically find this out quickly and fix the issue. They look amazing when all they really did was get the content you had already written actually indexed by Google. While it is fair to say they’re just doing their job, sometimes they like to take more credit than they’re actually due for this move. Increase click-through on rankings you already had. Many clients won’t know how to optimize title tags to increase the level of click-through but an agency can. You might already be ranking in the top spots for a keyword but by simply tweaking those title tags with a call-to-action will actually get people to click your link. They get you caught up in reporting. Something that always surprises me is how few clients actually track their organic performance. When an agency begins the relationship they will send some kind of regular reporting over which might leave you caught up in the “bright lights” of finally seeing some hard numbers. The value of an agency should never be on reporting but many clients get caught up in seeing a level of transparency and data that they’ve never seen before. There are many more ways and strategies an SEO company can get you into this phase but those are just some of the top ones we always see. This has been a great relationship! Let’s get permanent tattoos of our names on each other. If they haven’t already, the agency might try to force you into a long-term contract with a big fee for exiting early. They will say it is just their standard practice and to not be worried. You should definitely be worried. Evasive or non-existent answers. That high level of communication and love that they showed you in the first few months has disappeared. Your questions take days to answer compared to the mere hours it took in the beginning of the relationship. We can do that but it will cost more. A good relationship has give and take. You might have to go to a family get together you really don’t want to go to and they will have to go to a work happy hour for you. The same thing should exist for the relationship between clients and agencies. Asking one off questions that might be slightly outside of the SEO scope (maybe a question about affiliate marketing) and getting a response of, “that’s not included in your monthly SEO fee” can be troubling. You deserve a relationship where you feel valued and this is one of the big signs of trouble ahead. I like you but I like others more. The number of clients an agency or consultant has shouldn’t dictate how much (or little) attention you get. If they have the right process setup, each client will feel they get the proper attention they deserve. However, many companies will prioritize communication, work, and effort to their higher paying clientele and leave the smaller ones behind. Just like a relationship, you should never feel second best to anybody. Typically, this phase will start to draw some very clear lines in the sand on what your agency is and isn’t willing to do. You might start to see what will become the norm for this relationship as you’ve officially moved out of the “love drunk” phase you started in. Contract Renewal Time = Wined and Dined. You’ve been going through simple motions like monthly reviews of performance and have seen a few creative ideas thrown your way on occasion for new digital marketing efforts. You’ve felt neglected but as time approaches to renew a long-term contract, you suddenly hear from the agency more. They give you more attention and you begin to get those similar feelings at the beginning of the relationship. Then, right as you think things are starting to change for the better, they hit you with a request to renew your contract. Unwilling to take a short-term contract. This one should definitely raise eyebrows. 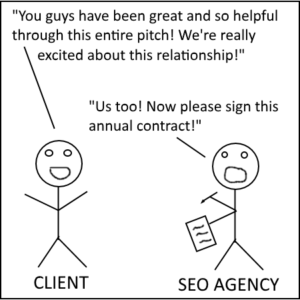 If an agency is doing a superb job on the SEO side of things, there shouldn’t be any issues with short-term contracts or providing a client an out for unforeseen challenges (budget changes, unhappiness with their SEO services, etc.). We believe that if a client wants to end a relationship, you shouldn’t force them into paying a crazy fee to get out of it. That client will just be sure to tell everybody they know how terrible of an experience they had with you. End the relationship amicably and they’ll likely not say bad things about you to others (just like a normal relationship). Year over year comparisons just don’t add up. We see this one the most. The agency has ridden the wins from the first phase and neglected to add content or build links to the site for multiple months. When you look at your organic traffic after a year of service with them, you see that performance is flat or has even dropped. You’ll hear excuses but in the end, they’re just that: excuses. If you make the mistake of signing another long-term contract, you can almost guarantee that this phase will rinse/repeat. We understand the ideas behind contracts but realize in the end that most are unneeded and ignored in the end (by both the client and the agency). We believe in relying on performance being the reason an SEO campaign is renewed every month and not because a lawyer says you have to.